BMW Motorrad are presenting two premium vehicles on the maxi scooter segment for the 2012 model year with the striking new models produced at the BMW Motorrad plant in Berlin. The differing characteristics of the concepts behind these two maxi scooters appeal to a wide target group: the C 600 Sport for the riders with sports ambitions, and the C 650 GT for customers attaching greater importance to comfort and touring ability. BMW claim both models ride more like a motorcycle than a conventional scooter on the highway or in the hills while combining the excellent urban manners of a scooter. The two-cylinder inline engine of the C 600 Sport and C 650 GT is an all new development by BMW Motorrad with a displacement of 647 cc. In both models, its rated power output is 44 kW (60 hp) at 7500 rpm, and its max torque of 66 Nm is available at 6000 rpm. The power is transferred via a directly integrated CVT. The engine owes its low position and therefore low centre of gravity to its cylinder bank, which is inclined forward by 70°, with a 90° crank pin offset and 270° ignition spacing providing a unique sound while spur gear driven balancer shafts keep the movement in harmony. An electronic fuel injection system supplies the four valves under the two overhead camshafts. 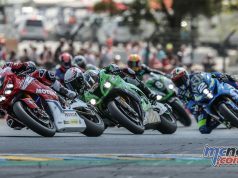 Oil is supplied from a dry sump with double oil pump, and an efficient cooling concept optimises the thermal equilibrium in the 2-cylinder engine. 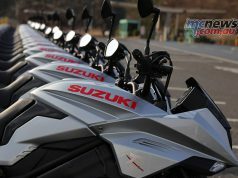 The exhaust system is made completely of stainless steel and complies with motorcycle specifications. The design of the C 600 Sport and C 650 GT suspension features a torsionally rigid hybrid interconnection of a tubular steel bridge frame and a diecast aluminium unit at the swingarm bearing. In addition, the 2-cylinder inline engine functions as a stressed element, presenting a particularly rigid construction for stable and high precision response. The greatest possible riding stability is also provided by the bearing for the cast light-alloy single swingarm with coaxial centre of rotation. Also the suspension elements fulfil more fastidious needs for sporting character and comfort. At the front, an upside down fork presents a generous fork diameter of 40 mm. The tail presents a reclining spring strut on the left side. The spring travels are each 115 mm, as they also occur quite commonly on the motorcycle sector. Also the tyre widths and cross sections of the C 600 Sport and the C 650 GT are aligned to motorcycle dimensions. The new C 600 Sport and C 650 GT are fitted with a generously sized braking system consisting of a two-rotor disc brake at the front and a single disc brake at the rear, each 270 mm in diameter. At the same time, the BMW Motorrad ABS fitted as standard ensures maximum possible safety. The instrument cluster of the C 600 Sport and C 650 GT presents a large, easily readable LCD display with integrated engine speed readout and an analogue speedometer. Efficiency optimised 2-cylinder inline engine with high torque and CVT. The most powerful and efficient engine of its class. Compact design with dry sump lubrication. Power output 44 kW (60 hp) at 7500 rpm, max torque 66 Nm at 6000 rpm. Punchy sound and low vibration levels thanks to the 90° crank pin offset, 270° ignition spacing, and two balancer shafts. Low fuel consumption and low emissions thanks to electronic fuel injection and closed loop catalytic converter. Suspension concept similar to a motorcycle; particularly rigid and hence more stable suspension system of tubular steel bridge frame and diecast aluminium unit at the swingarm bearing. Generously dimensioned upside down fork with 40 mm diameter. Swingarm with wide bearing base and reclining spring strut on the side. Swingarm’s centre of rotation coaxial with the output shaft, so constant chain tension and reduced reaction torques. Low maintenance, encapsulated secondary drive via roller chain in oil bath. High level of active safety thanks to generously sized braking system and dual channel ABS fitted as standard. Hold brake engaged automatically via the side stand. Multifunctional instrument cluster with onboard computer. Optional LED daytime running light. Either sporty, dynamic or luxurious, elegant in the characteristic BMW Motorrad design language. Generously sized stowage space. C 600 Sport with the world premiere FlexCase as an innovative stowage space concept. Powered (C 650 GT) or manual (C 600 Sport) windscreen adjustments for the optimal protection against wind and weather. Three colour variants for each. Extensive equipment and custom accessories of the familiar high BMW Motorrad quality. The differences between the C 600 Sport and the C 650 GT at a glance The sporty, dynamic scooter BMW C 600 Sport is characterised by a seat positioned for extremely active riding. This was made possible by the arrangement of the foot boards, seat, and handlebar in an ergonomic triangle. More fastidious needs for touring and long distance capabilities, on the other hand, are fulfilled by the luxurious C 650 GT. The rider and passenger can therefore adopt a more relaxed sitting posture that is highly appreciated especially over long stretches. The ergonomics designed for even greater passenger capability and comfort can be felt in particular on a more comfortable seat with adjustable backrest for the rider in conjunction with a higher handlebar and comfortable floor boards in lieu of separate footrests for the passenger. In addition, the C 650 GT presents a larger, powered windscreen for even better protection against wind and weather. C 600 Sport with dynamic seat position as a result of flatter handlebar, sporty seat design for both one and two persons, and sporty footrests for the passenger; seat height 810 mm. C 650 GT with emphatically comfortable seat position as a result of higher handlebar, more comfortable and larger seat with adjustable backrest for the rider, and foot boards for the passenger as well; seat height 780 mm. C 600 Sport with windscreen adjustable mechanically to three positions. C 650 GT with larger windscreen adjustable electrically over 10 cm for even greater comfort and protection from wind and weather. C 600 Sport with sporty, spartan panels. The lean tail with the dynamic upswing and emphatic body edges lend it lightness and dynamics. C 650 GT with an organic design language emphasising comfort attributes. Generously sized panel parts for outstanding comfort and protection against wind and weather. C 600 Sport: front turn indicators integrated in the panelling, twin circular headlights with two side lights on the left and right, LED rear light cluster with single turn indicators C 650 GT: front turn indicators integrated in the mirrors, twin circular headlights with side lights between them presenting a vertical light strip of three elements, LED rear light cluster with integrated turn indicators. C 600 Sport with world premiere FlexCase and hence variable stowage space concept in the tail under the seat. Despite its sporty, spartan tail section, two helmets can be easily stowed in the parked vehicle. C 650 GT with a large stowage space of about 60 litres in the tail for taking two helmets and other utilities. The all new 2-cylinder inline engine developed by BMW Motorrad for the C 600 Sport and C 650 GT is designed with a 79 mm bore and 66 mm stroke for a displacement of 647 cc. In both models, its rated power output is 44 kW (60 hp) at 7500 rpm, and its max torque of 66 Nm is available at 6000 rpm. The max engine speed is 8500 rpm. The engine is a stressed member of the frame, and not in rubber mounts, for optimal vehicle rigidity and hence high riding stability. The four valves per combustion chamber are timed in the classical manner via two overhead cast camshafts driven by a toothed chain and bucket tappets on shims. The toothed chain is guided along two slide rails. The cylinder head presents a highly compact design. The valves present an intake angle of 12° and an exhaust angle of 14°. The compression ratio is 11.6:1. The valve heads measure 31.5 mm across on the intake side, and 27.1 mm across on the exhaust side. Fuel induction is the responsibility of an electronic fuel injection system in conjunction with two power-closing 38 mm throttle valves and the digital engine management system (BMS-E). This engine management system analyses a large number of influencing variables for a particularly convincing performance with low power consumption and excellent cold start behaviour. The fuel capacity is 16 litres (4 litre reserve). The engine casing of die-cast aluminium is split horizontally at the centre of the crankshaft. Designed as so called open deck elements, the 2-cylinder liners are integrated in the top section of the casing. The target of low installed height also benefited from the use of dry sump lubrication that did away with the oil sump. The lubricant is circulated by a double oil pump with intake and return stage driven by the bottom balance shaft via a spur gear. The oil tank is integrated directly in the engine casing for the most compact possible measurements. An electronic oil level monitor in the cockpit warns the rider when the lubricant has reached the minimum level. In addition, the oil supply can be examined with a dipstick. The total quantity of oil is 3.1 litres with filter change. At the same time, the top balance shaft also serves to vent the crankshaft on the rotating ventilation principle. The whole powertrain weighs just 81 kg. Made to BMW Motorrad standards, the refined cooling concept provides for the optimal thermal balance in the 2-cylinder inline engine. In this case, cold coolant passes through the cylinder head in the transverse direction, entering the front of the head on the hotter exhaust side. Here, at the site of the greatest thermal load, this intense cooling quickly conducts away heat for the best temperature compensation. Like the oil pump, the water pump is driven by the bottom balance shaft via the spur gear. The quantity of coolant (52% water, 48% Glysantin) is 2.2 litres. The water cooler of aluminium with plastic radiator tanks and integrated thermostat utilises the same high performance cooler network as is also fitted in BMW motorcycles. For the optimal centre of gravity and flow properties, it is positioned under the steering head. Thanks to its high efficiency, optimised air feed, and the best possible air passage, a relatively small area proves adequate for a reliable dissipation of heat under all conditions. In longer stop and go or stationary traffic conditions, an electric fan switches in automatically to cool the running engine. The temperatures between the engine oil and the liquid coolant are balanced through an oil-water heat exchanger that also reduces the engine’s warm-up period to a minimum. The forces inside the drive unit are transferred via a central output from the crankshaft to an intermediate shaft with torsion damper connected with a primary toothed chain. At the same time, this intermediate shaft operates as the input shaft to the continuously variable transmission (CVT) with automatic centrifugal dry clutch on the output shaft. 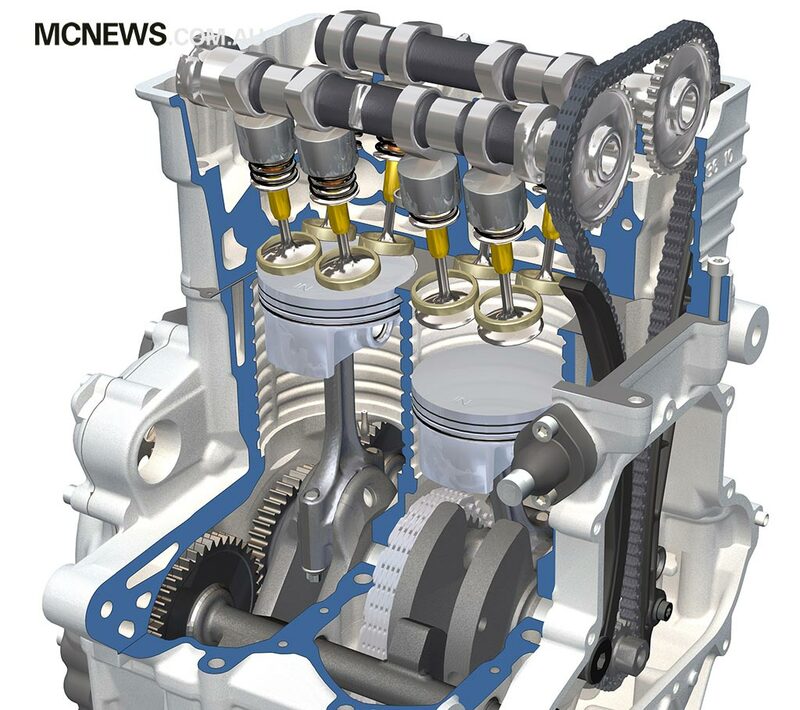 The CVT is connected rigidly to the crankcase. Two gear stages arranged directly behind the clutch provide the reduction ratio needed for the secondary drive. The secondary drive to the rear wheel is transferred over a roller chain with 72 links and 525 pitch. This runs fully encapsulated in the oil bath (750 ml SAE 90) and therefore needs very little maintenance. In this respect, a constant chain tension in all suspension states and a low reaction torque from the drive forces are ensured by a BMW Motorrad patented swingarm lying concentrically to the gear output. Fitted with a front and rear silencer, the exhaust system is made completely of stainless steel to motorcycle specifications. In this case, the silencer system utilises a complex combination of absorption and resonance damping. Fitted with an oxygen sensor and closed loop catalytic converter integrated in the front silencer, both of these maxi scooters fulfil the emission limits of the future EU4 standard. The top priority in developing the suspension for the C 600 Sport and C 650 GT was to combine the best handling qualities and a transparent feedback for the rider with stable directional stability at high speeds. With a wheelbase of 1591 mm, a steering head angle of 25.4°, and trail of 92 mm, the C 600 Sport and C 650 GT present key geometry features that don’t need to shun comparison with motorcycles. In the field, the overall concept behind the two maxi scooters’ suspension systems manifests itself particularly in ease of manoeuvrability, for instance in city traffic, and in fascinating riding stability on country roads and motorways. The frame of the C 600 Sport and C 650 GT presents a hybrid structure. The main frame of the C 600 Sport and C 650 GT consists of a torsionally rigid tubular steel bridge structure as it is usually found only on motorcycles. For the first time in the history of BMW Motorrad, this tubular steel design is supplemented at the swingarm bearing with a bolted die-cast aluminium unit that lends additional rigidity to the whole structure of the vehicle. In addition, the 2-cylinder inline engine functions as a stressed member, for a particularly stable and high precision response. The rear suspension is based on a single swingarm of diecast aluminium and includes the low maintenance secondary drive. The swingarm consists of a single part and is supplemented with a bolted aluminium side cap providing additional torsional rigidity. The target of the greatest possible riding stability also benefits in particular from the swingarm bearing that, contrary to the usual practice on scooters of fitting it in the engine casing, is instead fitted in the frame, the usual practice on motorcycles. Also, the swingarm’s centre of rotation is arranged coaxially to the drive shaft as a measure to minimise drive torques and suppress fluctuating states of tension on the secondary chain. The asymmetrically arranged spring strut is installed at a reclined angle on the left side of the vehicle, and its mount can be adjusted to diverse loading states. The spring travel is 115 mm. The damper tuning on the C 650 GT provides a particularly high level of comfort in line with the vehicle concept. The front suspension is provided by an upside down fork with a diameter of 40 mm and a spring travel also of 115 mm. The two fork bridges are forged steel parts. A welded steel structure, the handlebar is bolted directly to the top fork bridge. On their front, the C 600 Sport and C 650 GT roll on a 3.5 x 15“ five spoke diecast light alloy wheel fitted with a 120/70-15 tyre. The rear wheel measures 4.5 x 15“ and is fitted with a 160/60-15 tyre. Here too, the maxi scooter presents a series of widths and cross sections aligned to customary motorcycle specifications. The 15“ rims safeguard the highest riding stability with the optimal agility and handling. The highest level of active safety is provided by the generously sized braking system in conjunction with the BMW Motorrad ABS fitted as standard. At the front, sustained braking is ensured by a two-rotor disc brake of 270 mm diameter and two double-piston floating callipers with 25.4 mm piston diameter in conjunction with a 12.7 mm handbrake cylinder. At the rear, this task is the responsibility of a single disc system likewise with 270 mm diameter, double-piston floating calliper with 27 mm piston diameter, and 14 mm handbrake cylinder. All brake lines are designed as flexible steel elements for a stable pressure point and best possible dosability. The two brake levers can be set to five levels for individual ergonomics adapted to the rider’s needs. Tipping the scales at only 700 g and with an extremely small installation space, the Bosch 9M type dual channel ABS allows independent regulation of the two braking circuits for the front and rear wheels. BMW Motorrad developed a particularly innovative solution for the mandatory hold brake on scooters. Whereas the rider normally has to engage this brake with a separate lever, this is engaged automatically on the C 600 Sport and C 650 GT when the side stand is extended. This is connected to a pull cable that engages a second, mechanically actuated rear braking calliper that prevents the vehicle from rolling away. This measure makes sure that the vehicle is parked absolutely safely. The range of optional equipment ex works for the C 600 Sport and C 650 GT also includes the tyre pressure control RDC. Here, sensors installed inside the rims register the current air pressure and communicate this information to the display field in the instrument cluster. The foot boards allow the rider to place his feet for greater riding ease and comfort. Like on a motorcycle, the passenger on the C 600 Sport has footrests, while the C 650 GT presents foot boards in this area as well. The electrical system in the C 600 Sport and C 650 GT is based on the established systems fitted in the BMW Motorrad models. The electrical system is based on a CAN bus (controller area network). This networks the instrument cluster, the ABS and engine controller, the electronic immobiliser, and (as optional equipment) the anti-theft alarm system and the tyre pressure control (RDC). The standard scope also includes a power socket installed in the left storage compartment. For example, this can be used to recharge a mobile phone while it is connected via Bluetooth to the BMW Motorrad communication system, where available, in the rider’s helmet. A strong and stable power supply under all operating conditions is safeguarded by the alternator located on the left tail shaft and delivering 588 W. The battery has a capacity of 12 Ah and is installed in the vehicle’s front section behind the right side panelling. The cable harness on the C 600 Sport and C 650 GT is designed to allow retrofits of all optional electrical equipment ex works and all optional accessories like e.g. heated grips, heated seat, alarm system, tyre pressure control RDC, etc. The instrument cluster on the maxi scooters presents considerably more functions than usual in this vehicle class. It presents a large, easily readable LCD display with integrated engine speed readout and an analogue speedometer with a highly legible scale. The instrument cluster also integrates all indicator lights. The development of this instrument cluster focused primarily on the best legibility and the elimination of reflections on the display. The analogue speedometer and the LCD display are illuminated in easy to read orange. This lighting is deactivated when the daytime running light is activated. Besides the eight bars representing the fuel level, the instrument cluster also presents as standard useful details on the oil level, distances travelled, and (via the onboard computer) distance covered on the 4-litre fuel reserve, date and time, average fuel consumption and rate, ambient temperature, and service information. The top part of the display also presents warnings in the form of text and symbols, e.g. when a light source fails. The display also presents the operating state of the optional equipment heated grips and heated seat. LED lights, optional LED daytime running light, and way home function. The maxi scooters C 600 Sport and C 650 GT are already fitted as standard with a rear light and LED stowage space lighting. The LED technology is characterised in particular by exceptional reliability, long service life, high luminous efficiency, and low power consumption. The front lighting on the C 600 Sport consists of one headlight each for low and high beams and two side lights (or alternatively a combination of side light and optional daytime running light). The C 650 GT likewise presents two headlights, but the side light and optional daytime running light take the form of three LED light elements arranged at the centre. Both the side lights and the stowage space lighting come with a so called way home function, i.e. the light remains on after the vehicle has been parked. Whereas LED turn indicators are offered as optional equipment ex works for the C 600 Sport, this feature is fitted as standard on the C 650 GT. In addition, both models can make use of the highline package (optional equipment ex works) that provides the LED daytime running light, a rare treat today for that extra safety on the scooter market. For the first time at BMW Motorrad, the optional accessories and optional equipment heated grips and heated seat also feature a so called AUTO level with automatic temperature control in addition to Levels 1 and 2. When the rider selects the AUTO level, the heaters for the grips and rider’s seat are regulated automatically as a function of the outside temperature and vehicle speed. The heaters switch on automatically from an outside temperature of +8 °C. The heater output first starts very gradually and rises with falling outside temperature. The max heater output on the AUTO level is reached at -15 °C. The heater for the passenger’s seat can be activated at a separate switch by the passenger himself, when he can select Level 1 or 2. The switch fittings are known from BMW motorcycles and are available in various clusters depending on the equipment range. The right side presents functions like start/stop, heated grips (Levels 1, 2, and AUTO with outside temperature control) and heated seats (Levels 1, 2, and AUTO with outside temperature control). The left side integrates the functions for high/low beams, headlight flasher, turn indicators, hazard warning flashers, daytime running light, and horn. The C 600 Sport and the C 650 GT present the unmistakable design language of BMW Motorrad, setting new standards on this segment in this category as well. Modern and aligned to the future, they are the perfect examples of the BMW Motorrad design philosophy. They are thrilling representatives of a perfectly new interpretation of the maxi scooter. Their design utilises asymmetries and the typical split face as unique attributes that also distinguish and hallmark the BMW Motorrad models. 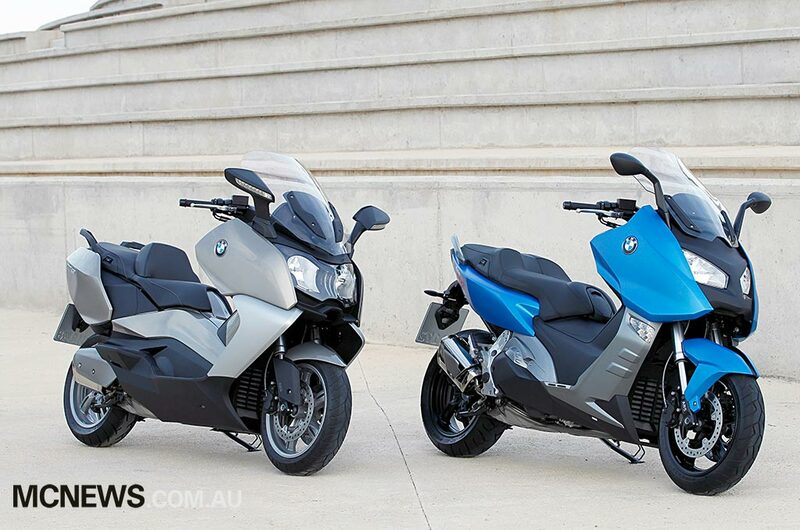 These two new maxi scooters from BMW Motorrad present a visual appeal that clearly stands out from the competition, for designer impressions communicating sporty dynamics or luxurious elegance. Yet the relationship between the two new maxi scooters and the BMW Motorrad family also becomes apparent on the technical side. For instance, the face is distinguished by a generously sized upside down fork and a two-rotor disc brake, just as on a motorcycle. 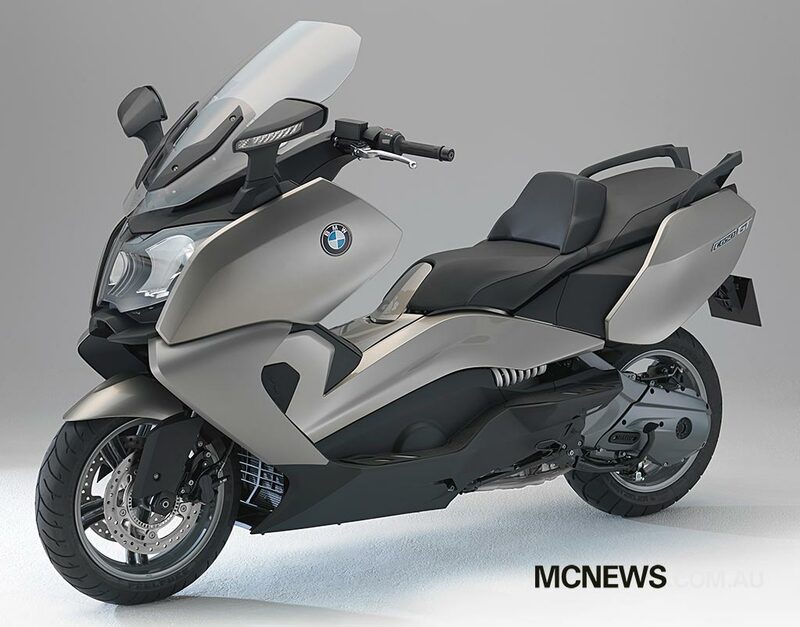 Meanwhile, the tail proudly bears a dynamically designed single swingarm with generously dimensioned, hollow wheel axle that is characteristic of BMW motorcycles. This dynamic impression is also underscored by the highly visible, reclining spring strut. 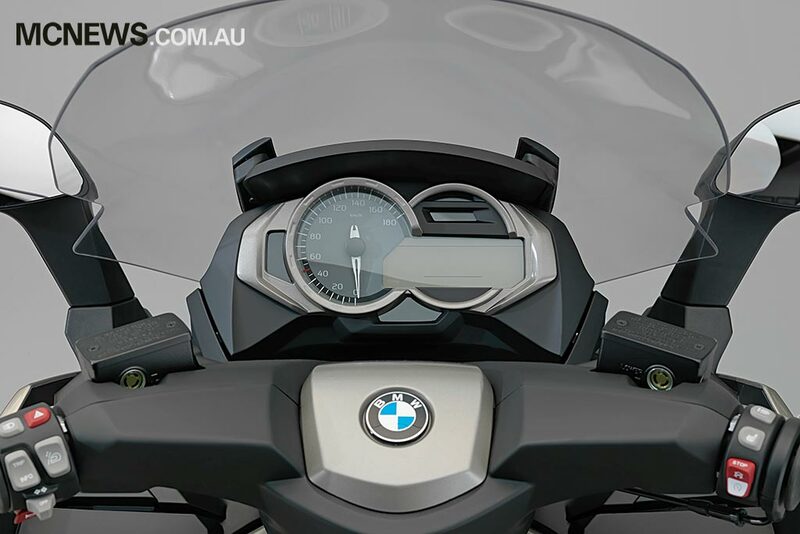 Yet another design element known from BMW motorcycles has been adopted in the form of the so called bash plates, or the side parts of the front panelling. 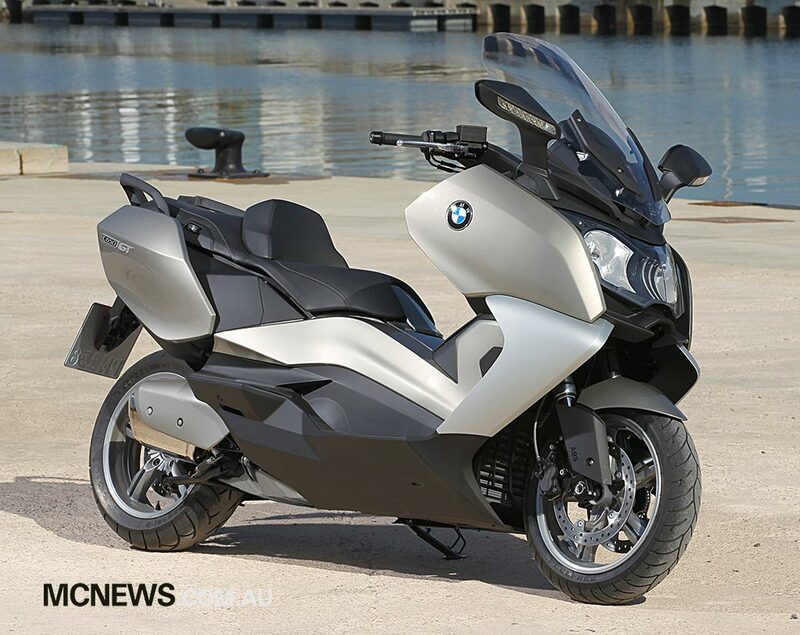 And also the twin tipped engine spoiler forges a design language link to BMW motorcycles. 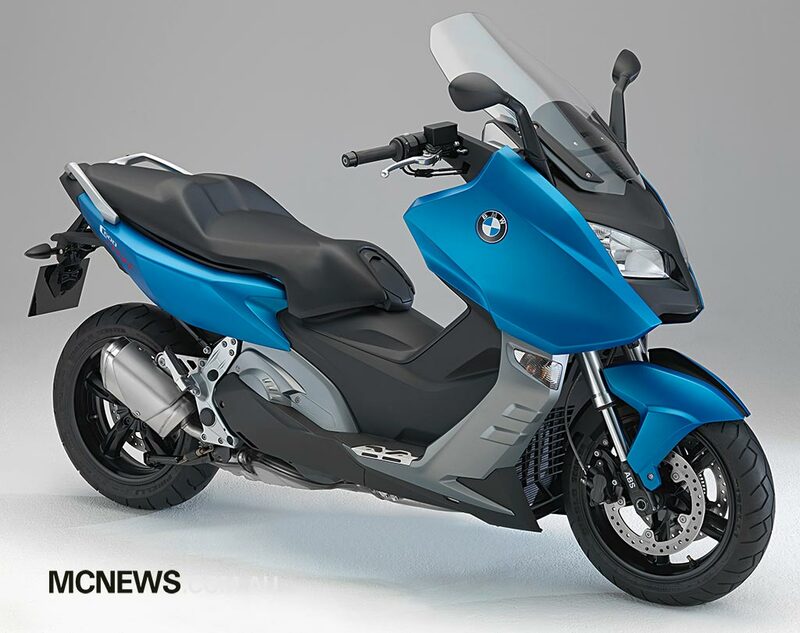 In terms of their technology, the two new maxi scooter models from BMW Motorrad are based on an identical platform, yet certain differences in their design testify to fully independent characters. Whereas the C 600 Sport stresses the sporty, dynamic properties of a maxi scooter, the C 650 GT delivers a fascinating performance above all in comfort and touring capability. This touring oriented design of the C 650 GT is also reflected in the design. This becomes clear particularly on the generously sized panelling parts on the C 650 GT for outstanding protection against the wind and weather, whereas the C 600 Sport appears in a sporty, spartan dress. On the C 600 Sport, lightness and dynamics is also embodied especially in the lean tail with the dynamic upswing and the emphatic body edges, whereas the organic design language of the C 650 GT highlights comfort attributes. The designers also found it especially important to express in the formal design the technical closeness of the C 600 Sport and C 650 GT to the BMW Motorrad motorcycle family. Up until now, scooters with their deep drawn leg well invariably adopted a certain L shape with almost vertical body lines. 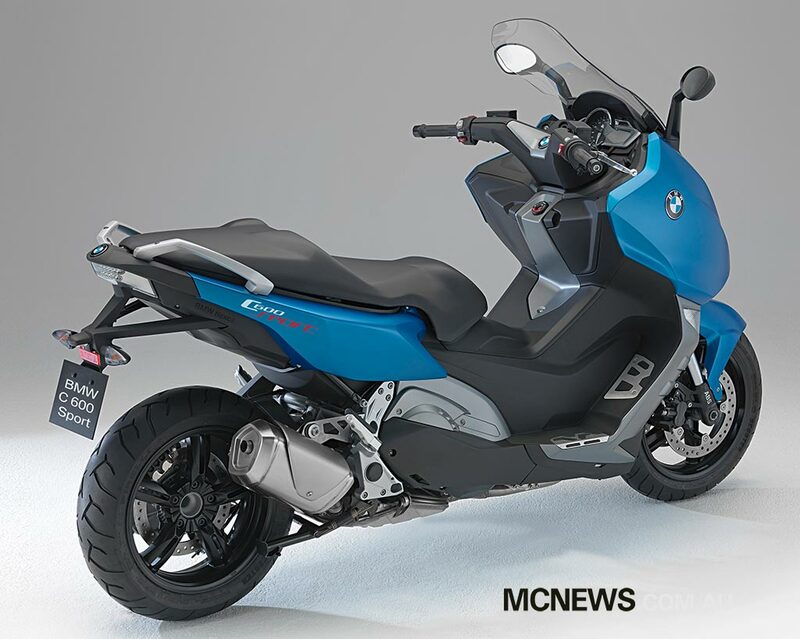 Although this typical leg well is likewise presented on the two new maxi scooters from BMW Motorrad, it resembles more a motorcycle by running diagonally like the tail section and panel body lines. 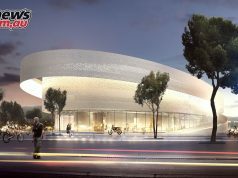 This gives rise to a particularly dynamic play of lines. The C 600 Sport presents a particularly sporty and emotionally charged look. Its colour contrast panelling parts communicate a decidedly compact design language. Even more strongly than on the C 650 GT, the highly visible spring painted white in the strut lends it its look of technical dynamics. The differences between the C 600 Sport and C 650 GT can also be found in the ergonomics. For instance, in line with its dynamic claims, the C 600 Sport presents a seat height of 810 mm and, together with the low mounted handlebar, provides a sporty, meditative seated position aligned to the front wheel. On the C 650 GT the seat height is only 780 mm. Aided by the higher handlebar position, the rider can adopt an upright, highly relaxed posture typical of touring. The high touring and long distance capabilities of the C 650 GT are also underscored by the generous stowage space consisting of a spacious storage compartment (about 60 litres) under the seat and two smaller compartments (locked on the left) in the front part of the leg well. The storage compartment with internal lighting in the tail of the C 650 GT can also take two helmets when the vehicle is stationary. In addition, the bulges on the left and right of the tail offer additional stowage space for utilities. The claims to comfort made by the C 650 GT – also for two persons – are likewise corroborated by the generously upholstered seat with the adjustable backrest for the rider. 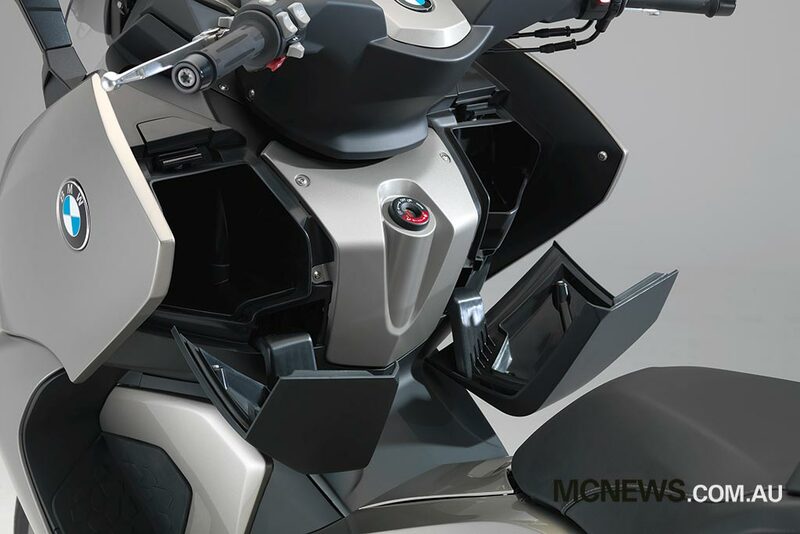 Although the tail section of the C 600 Sport is essentially shorter and sportier, the BMW Motorrad developers managed to integrate a stowage space concept that can also take two helmets on this model as well. The so called FlexCase was designed specifically for this purpose. This takes the form of a flap in the tail base that can be opened to deepen the available stowage space. This variable space is made possible by the use of a high strength, elastic material based on kevlar and providing a flexible, but dirt and water repellent connection between the flap and the tail base. 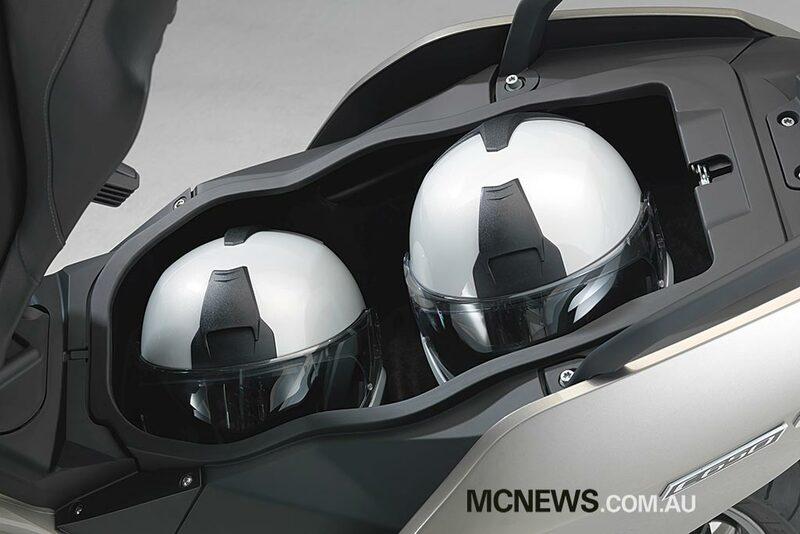 A world first and patented by BMW Motorrad, this stowage space solution can take two helmets when the vehicle is parked. The FlexCase flap is closed when the vehicle is moving. But it can still take one helmet. A safety switch makes sure that the engine cannot start when the FlexCase flap is open. When the flap is open, this appears as a warning symbol on the instrument cluster. On the C 600 Sport too, the stowage space under the seat is fitted with internal lighting. On both models, additional stowage space is available in the form of two glove compartments in the front part of the leg well. The one on the left can be locked. The compartments are locked automatically when the vehicle is parked and locked. For the transport of additional luggage, the C 600 Sport and C 650 GT can be fitted with a luggage rack (optional accessory) that also allows the installation of a top case (likewise optional accessory). The central lock also opens and locks the seat, the front left glove compartment, and the fuel filler cap. The fuel filler is situated for ease of access behind the fuel filler cap under the front end of the seat in the leg well. The differing characters of the two maxi scooters are also apparent when viewed from the front. On the C 650 GT, the front turn indicators are integrated in the mirrors. On the C 600 Sport, they are integrated in the panelling. Each of the mirrors on the C 600 Sport is adjusted manually, whereas on the C 650 GT the mirrors’ carrier plates are adjusted inside the mirror housing. Both vehicles feature twin circular headlights, but on the C 650 GT the side light is arranged between the two headlights as a vertical strip of three light elements. The C 600 Sport has two side lights positioned on the left and right sides. The elegant appearance of the C 650 GT is also reflected in the LED rear light cluster that also integrates the turn indicators. In line with its sporty, dynamic character, the C 600 Sport features single turn indicators. For the best possible protection against wind and weather and minimised wind noise, the windscreens of both maxi scooters were developed in the wind tunnel. The windscreen on the C 650 GT can be adjusted electrically over 10 cm (C 600 Sport: manually at two setscrews to one of three stages) and presents a larger area than the C 600 Sport. In addition, the C 650 GT features adjustable deflection wings on its panelling that when needed boost the supply of air to the rider. The optional accessories that BMW Motorrad offers for the C 600 Sport also include a tinted windscreen and a shorter, clear or tinted windscreen for an emphatically sporty look. On both the C 600 Sport and the C 650 GT, the foot boards are upgraded with high quality, sturdy stainless steel elements. The clear and dynamic design language is also continued in the uncluttered cockpit of the C 600 Sport and C 650 GT. Whereas the instrument cluster on the C 600 Sport is set in a cover panel painted a sporty Granite grey metallic matt, the C 650 GT features a refined Magnesium metallic matt. The stubby rear silencer of the C 600 Sport is of high quality stainless steel with a pentagonal cross section. In line with its sporty, dynamic visual appeal, it openly displays its stainless steel look, whereas the elegant, comfort oriented C 650 GT, although fitted with the same system, presents an additional silencer panel. BMW Motorrad offers its familiar extensive range for individualising the new C 600 Sport and C 650 GT. Optional equipment is delivered directly ex works and is integrated in the production process. Optional accessories are installed by the BMW Motorrad dealer. The vehicle can therefore be fitted with options after it has left the factory.